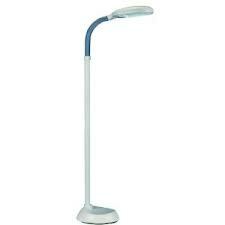 The Standard High Vision Reading Light is a white high-vision floor-standing lamp. The low energy bulbs create a near day-light effect. This makes them very good for reading as well as a study light. Reading a book is now so much easier and enjoyable. The light bulbs give day-light lighting and this eases eyestrain. Ideal if you have poor sight or limited vision. This floor standing reading light is so good you can now sit in your comfy chair and get good quality light. The flexible arm allows you to adjust the angle and makes sure that the light always shines at the right height and from the right direction. Includes metal stand and base and easy-access on/off switch. It introduces near daylight into your relaxation or work area. Flood light effect tube to cover maximum working area. This is supplied as a kit so some simple assembly is required. A little care is needed during assembly to avoid cross-threading the two sections of the stand, a light smear of Vaseline or petroleum jelly can make the assembly easier. Its easy to adjust the angle of the light. Now its easy to ensure the light always shines at the right height and from the right direction. It includes a metal stand, base and easy-access on/off switch. Reading is so much easier.